Christmas morning Jimmy Deguara sent me a message asking for the day's setup in the NSW north west and central west districts. 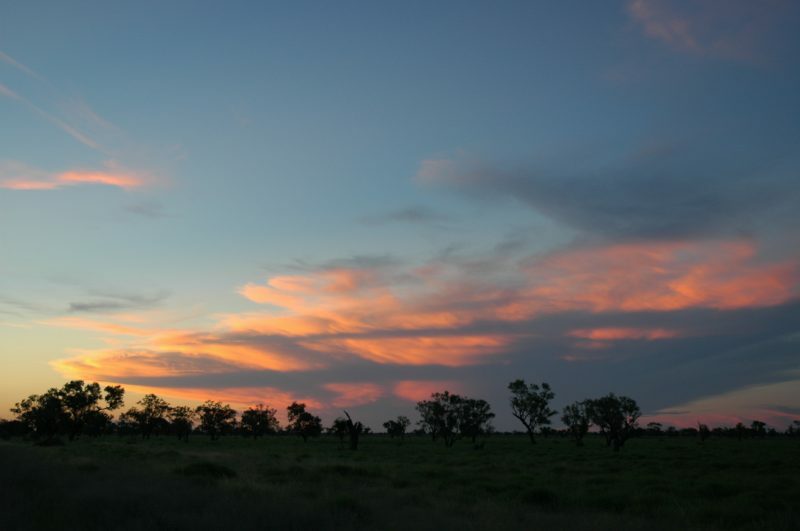 As I plotted the thunderstorm variables for the next two days it got me thinking how nice it would be to head off to the Moree area to chase for a couple of days. 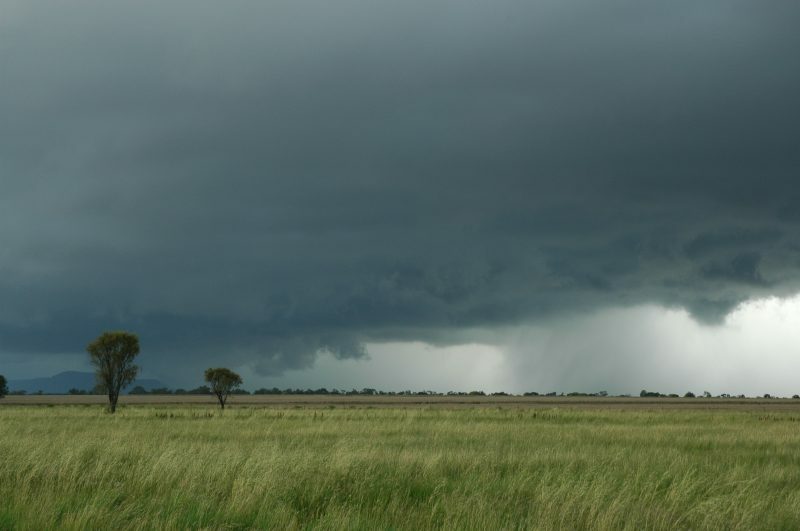 It wasn't till about 5pm when I returned to the PC after Christmas celebrations that it clicked: I had the next 2 days off and could head inland for chasing. 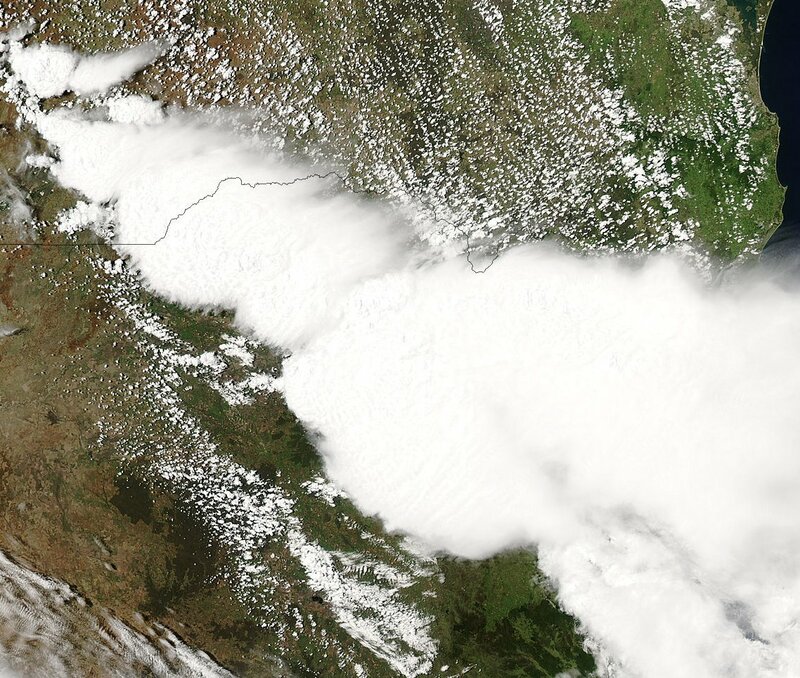 Sunday 26th and Monday 27th both had good instability centred on Moree - CAPE over 2000 and LI -6. Shear was poor for the 26th but was forecast to be very good by the 27th. I checked with Dave Ellem later on if he was available for chase and we then planned to head off at 6.30am on the 26th. GFS had downgraded the instability somewhat by the 12z run though it still appeared very likely thunderstorms would develop. We headed off as planned. 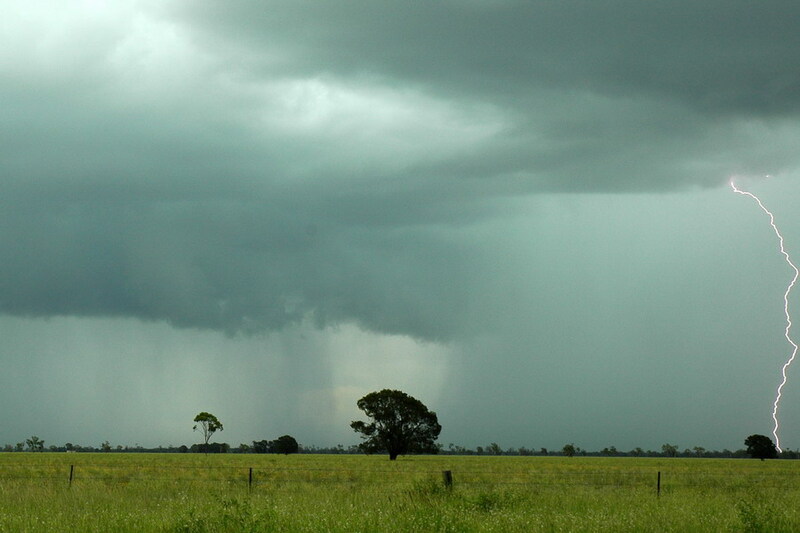 Some showers persisted in the Northern Rivers but soon eased as we headed up the Great Divide to Tenterfield. 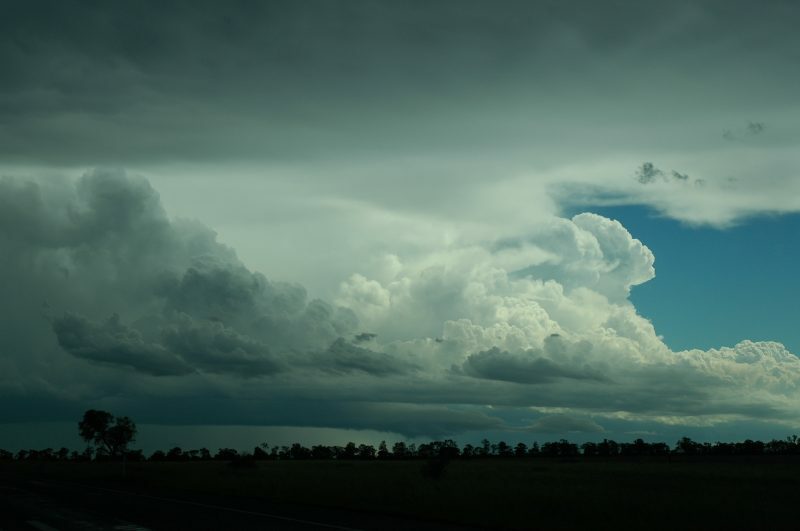 Heavy stratocumulus soon broke to scattered cumulus which thinned and cleared as the drive continued west from Glen Innes, through Inverell and on to Moree. 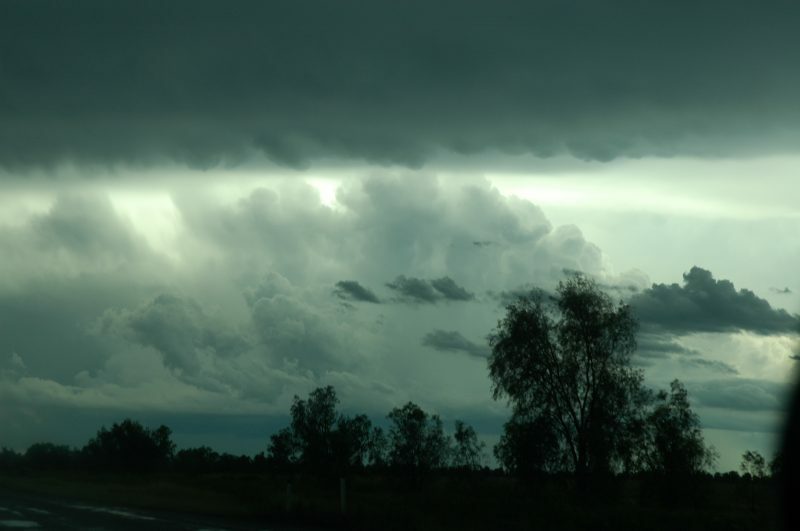 About 30km east of Tenterfield there was evidence of severe storms that had passed through the forests the evening before. 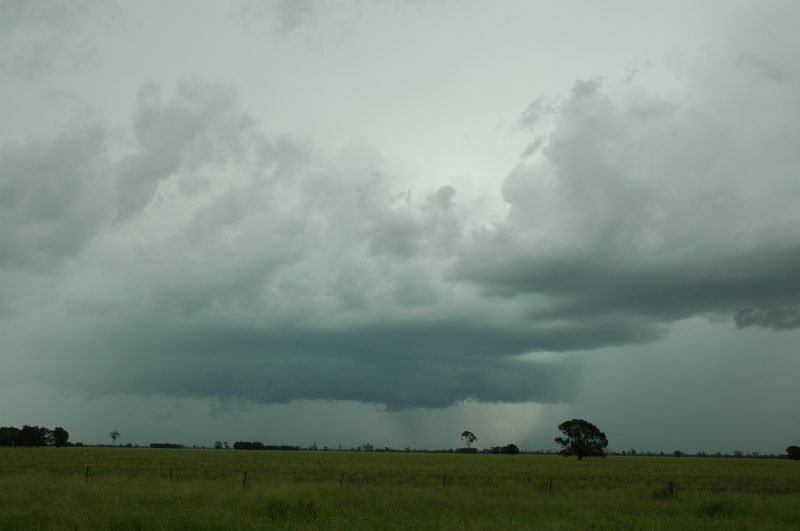 There was also evidence of severe storm activity at Warialda. Both locations had large branches off trees, leaves stripped and had obviously had very heavy rain with flash flooding. We arrived at Moree at noon and met up with Jimmy at McDonald's. 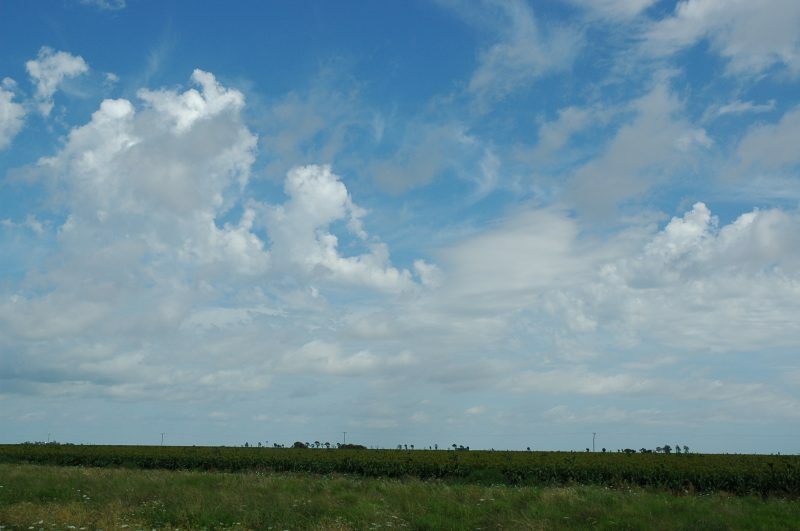 The sky was mostly clear with just small cumulus around. The temperature had climbed to about 33, winds were light and the dewpoint about 17 or 18. 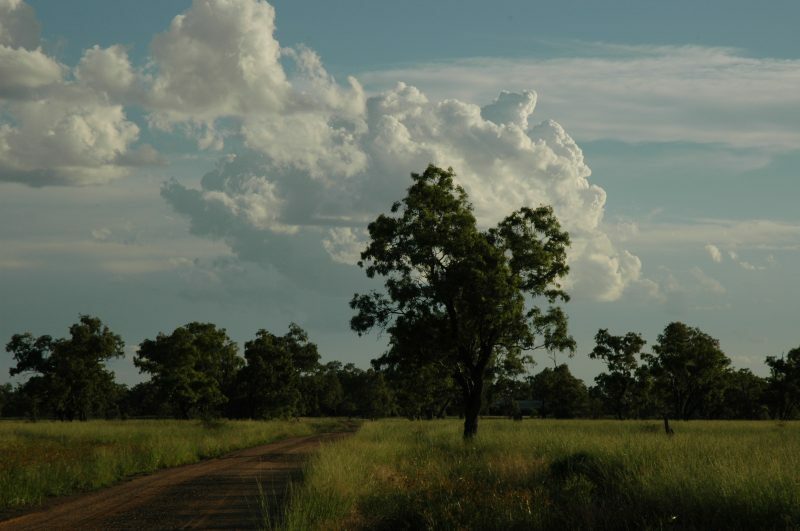 We moved to a location about 5km south of town with extensive views and a few shade trees. 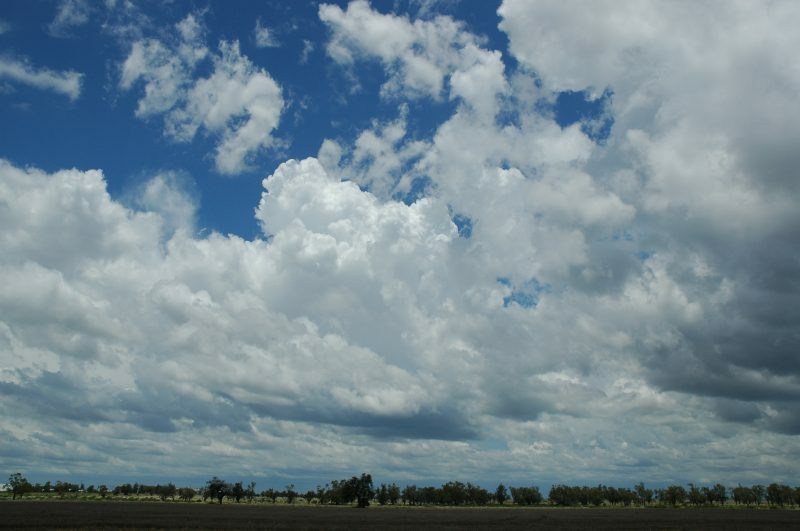 Some cumulus congestus formed to the north along the NSW Queensland border and another area of large cumulus developed south of the Narrabri area. 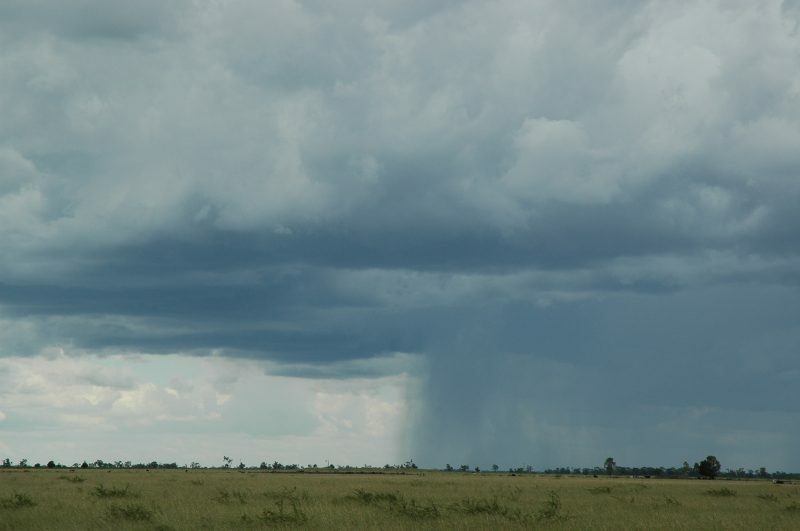 Both were about 150km away from us. 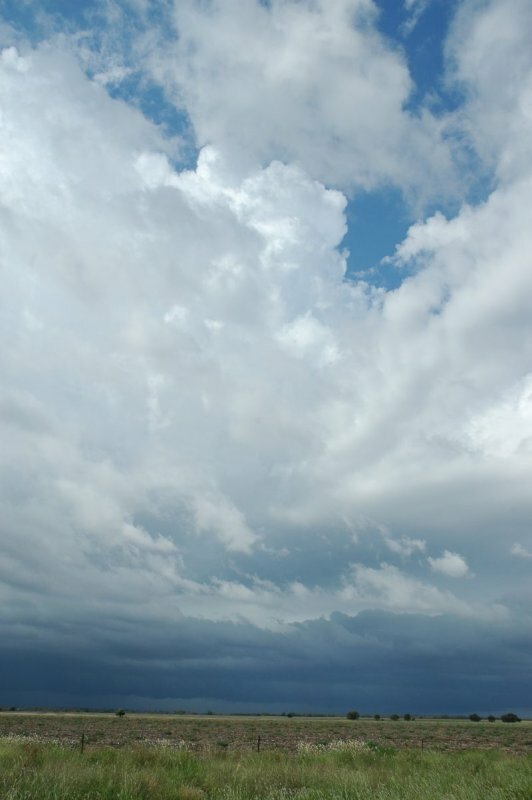 Some weak storms tried to get going over Mount Kaputar to our southeast, but nothing took off. We took time out at McDonald's then checked into a motel and looked at the latest data via the internet. 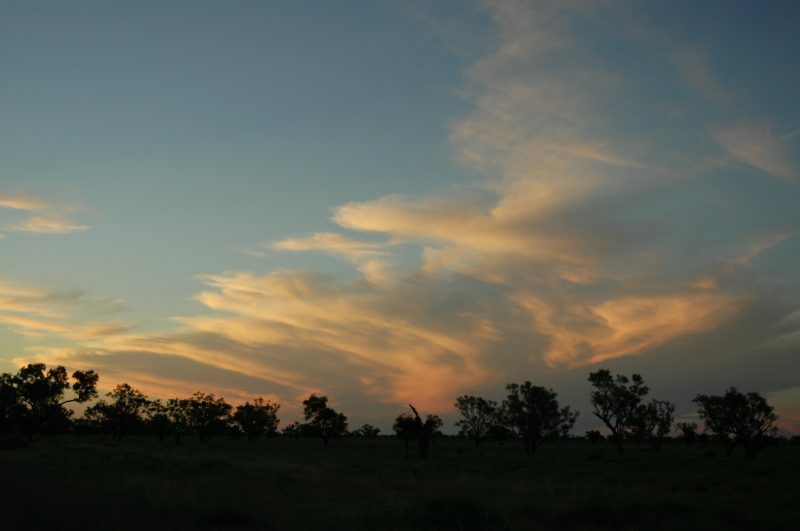 Later in the afternoon some activity appeared to our northwest, west and southwest so we headed out along the Collarenebri road. We waited about 50km west of town but again nothing took off locally. 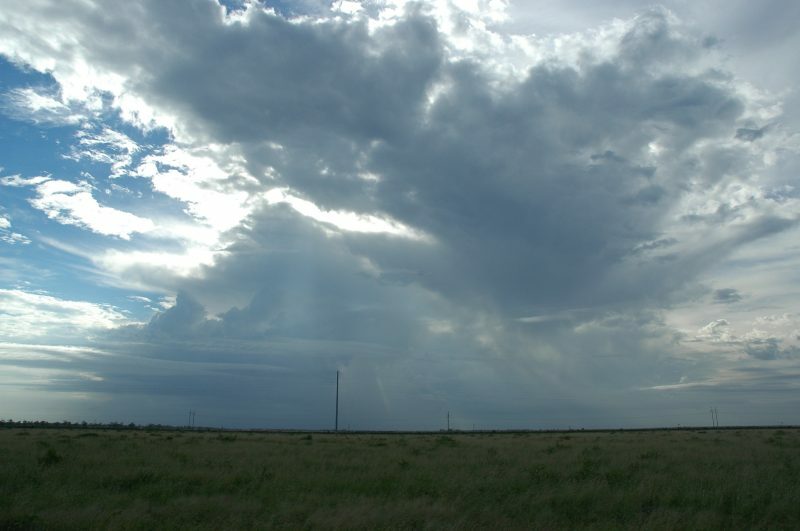 The cells to the west and SW were weak and narrow in appearance, though were generating some substantial anvils. 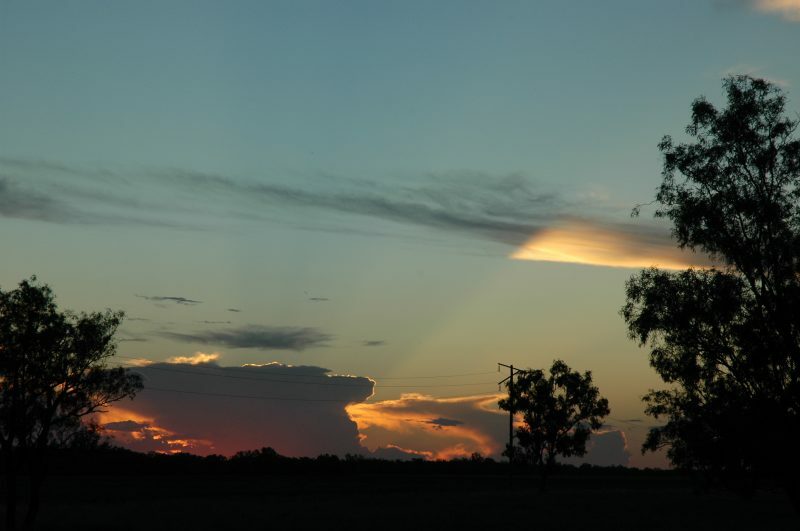 Sunset was the highlight of the day with a backlit cell to the WSW and illuminated anvil from activity over the border in Queensland. 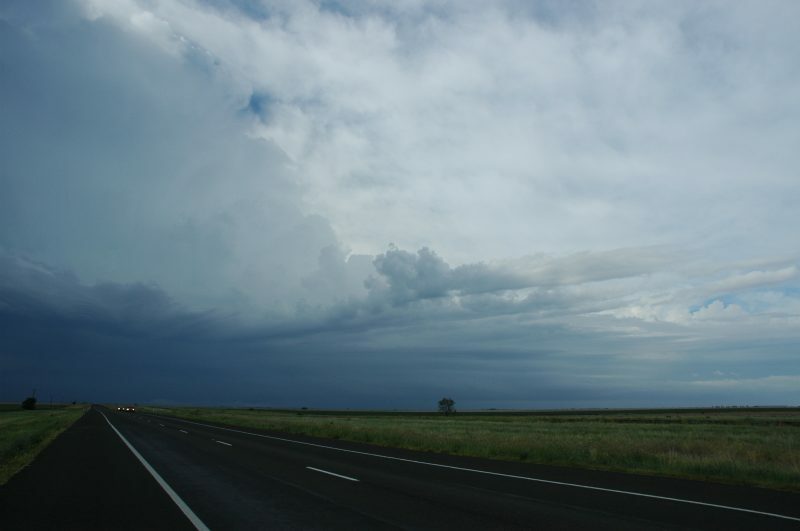 We returned to the motel in Moree and checked radar and the forecast for tomorrow. 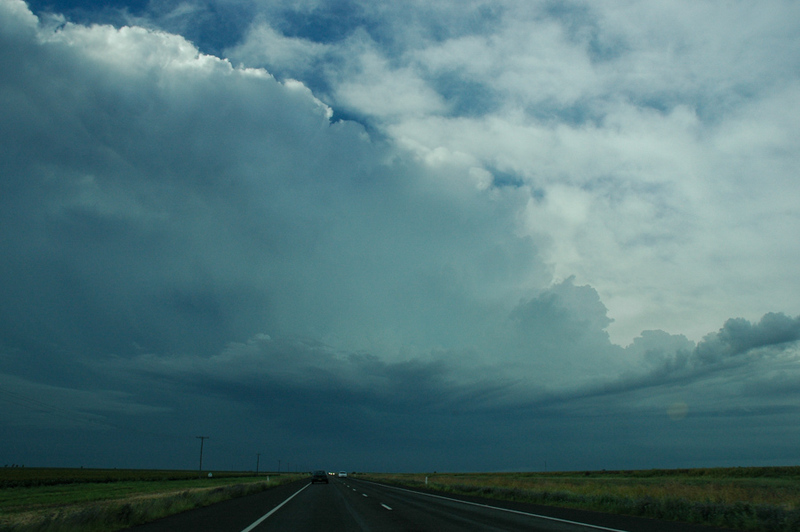 Some substantial cells were active in the Coonamble area - 200km to the SW. They were very slow moving and I suspected they may persist overnight and be in our local area by dawn. The latest GFS run had substantially altered the unstable areas for this day - it was now showing the Coonamble area as best - not much use after the event ! We woke about 7am and checked the skies and radar. 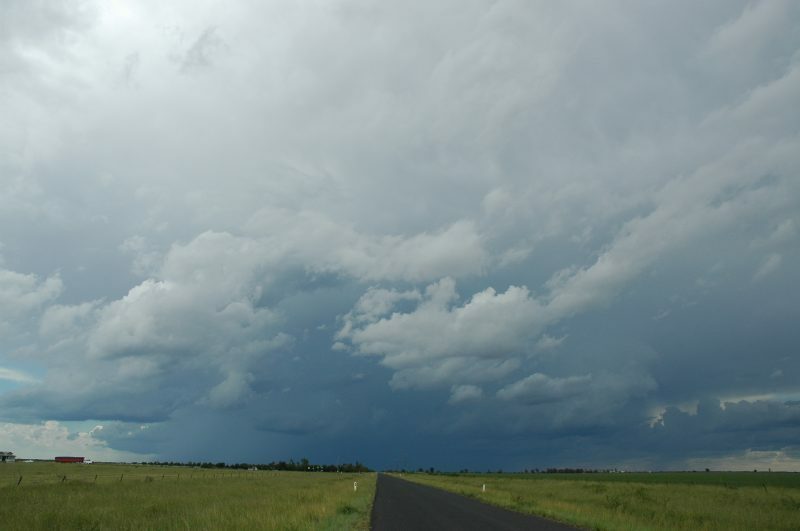 Storms were active in a WSW - ENE line close to Narrabri. 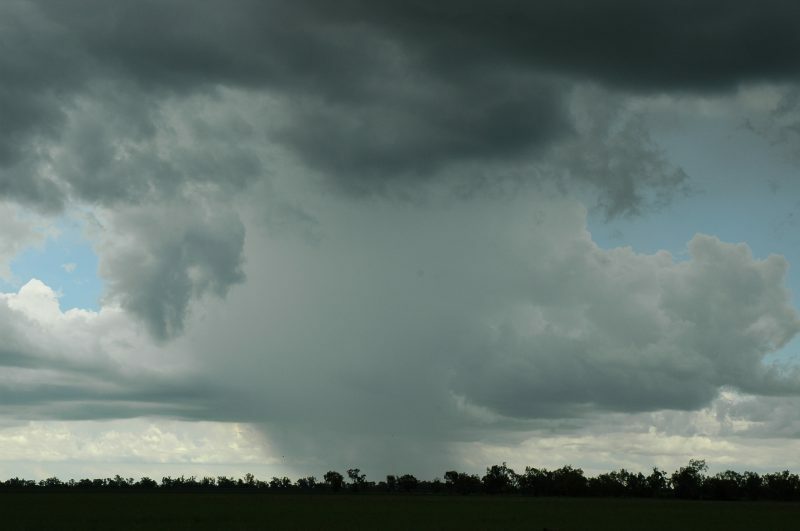 The most interesting cell was still west of Narrabri and reachable despite being about 100km away. 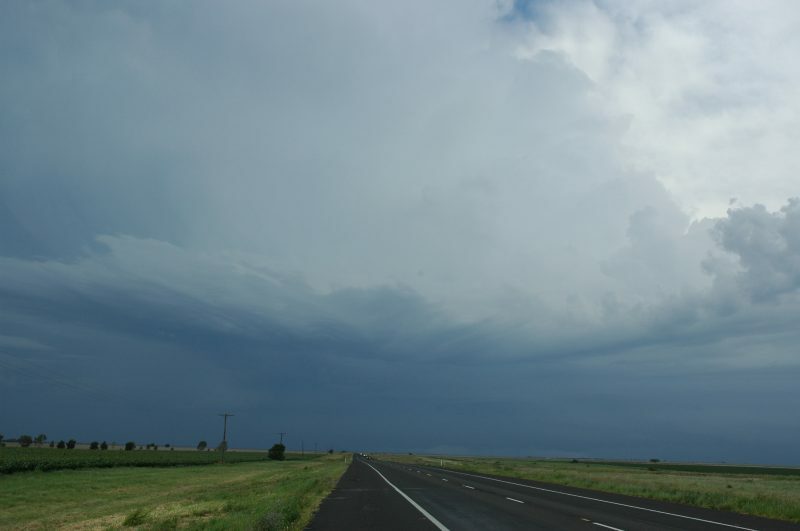 We raced south, watching powerful updrafts and lightning to the SSW. 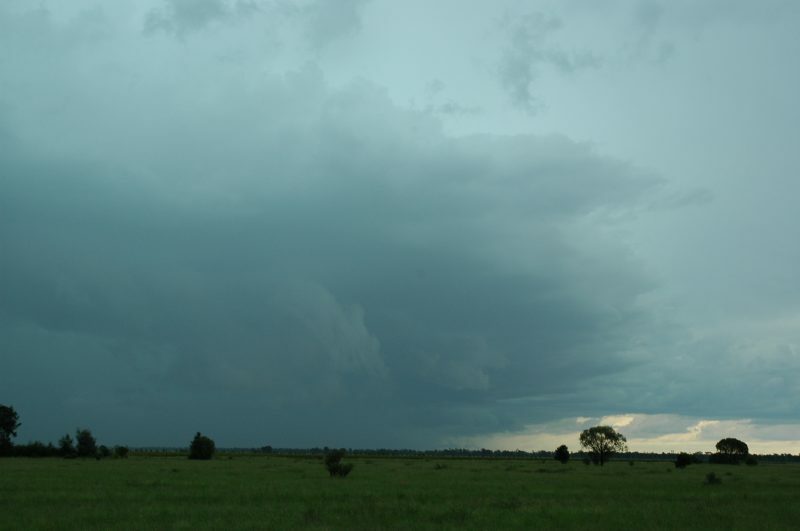 There was a strong inflow and multiple cloud bands into the base. 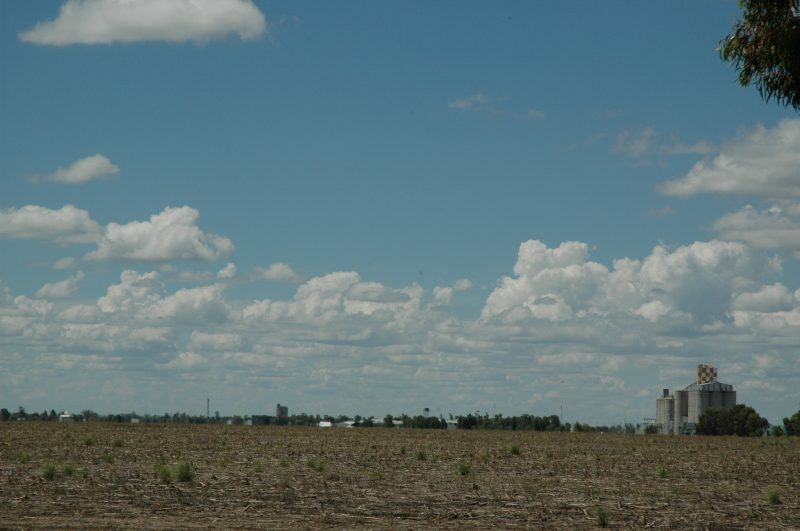 At 8.30am we stopped just south of Bellata, or about 40km N of Narrabri. A road heads east from here so it was an option if the storm headed NE. Dave and I wanted to get closer to the base, so left Jimmy at this point videoing the structure. We moved 10-15km closer, stopping at various locations to video and photograph the structure and base features. 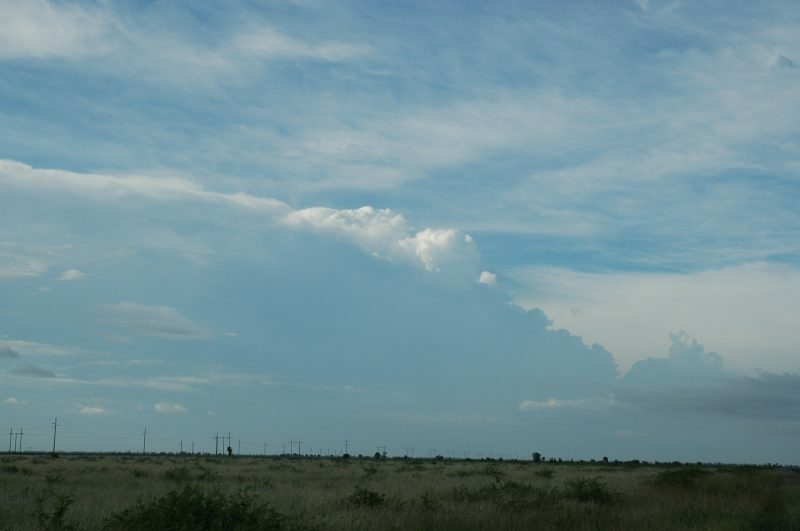 The anvil was very high and thick towards the NE. 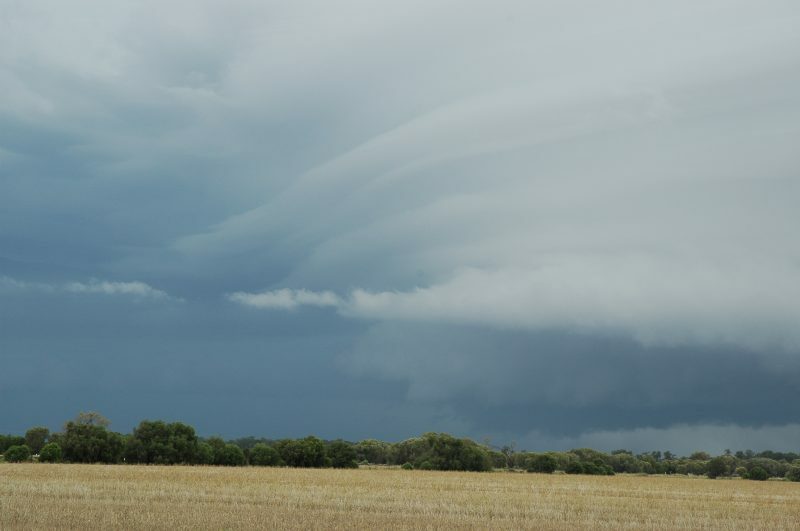 The base had interesting laminar banding and an inflow cloud curved into this from the NE. 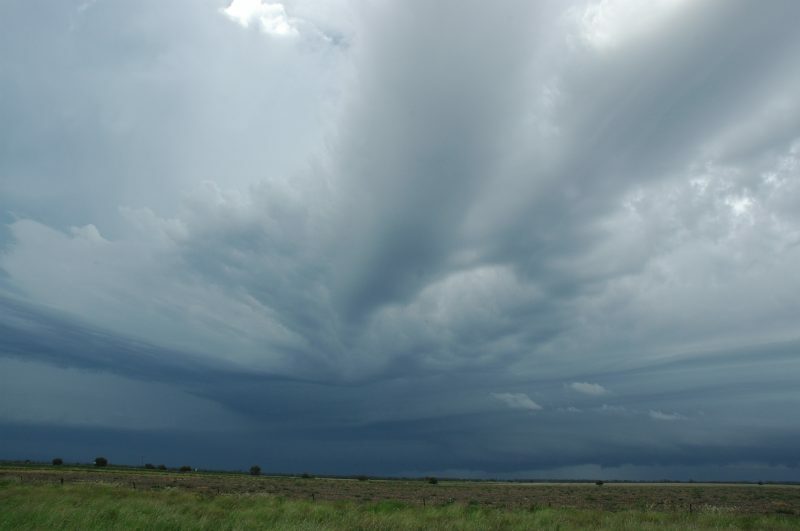 Various lowerings formed along the gust front and indicated very heavy rain and hail were falling. 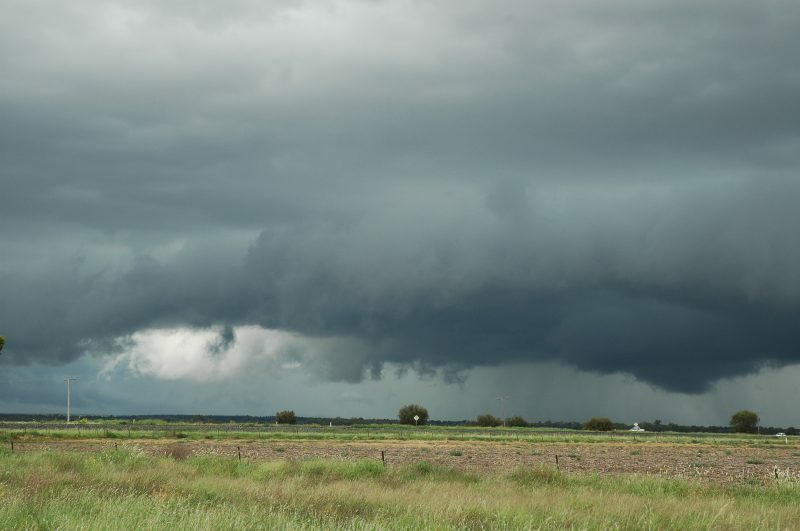 There were certainly characteristics of a supercell, and later radar inspection revealed a strong persistent veering cell with v-notch outflow. The storm tracked ENE so we moved a little further south to Edgeroi, then ENE from there. 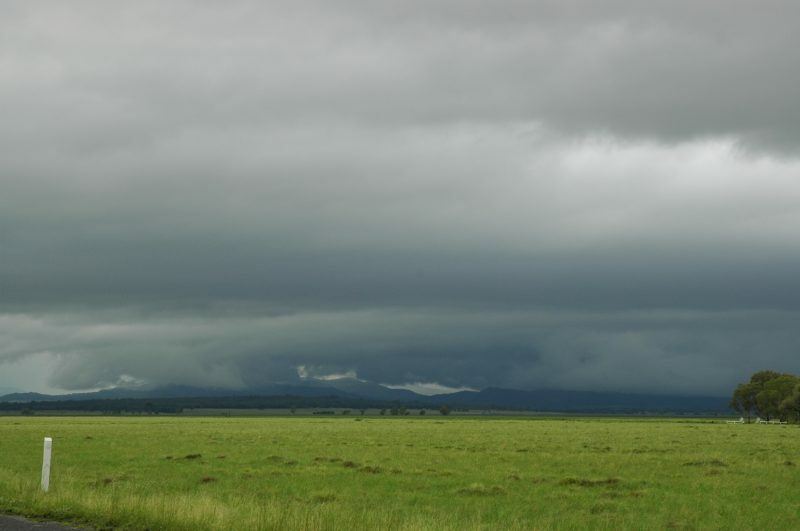 The storm was moving over Mount Kaputar. Pulsating lightning occurred beneath the base. 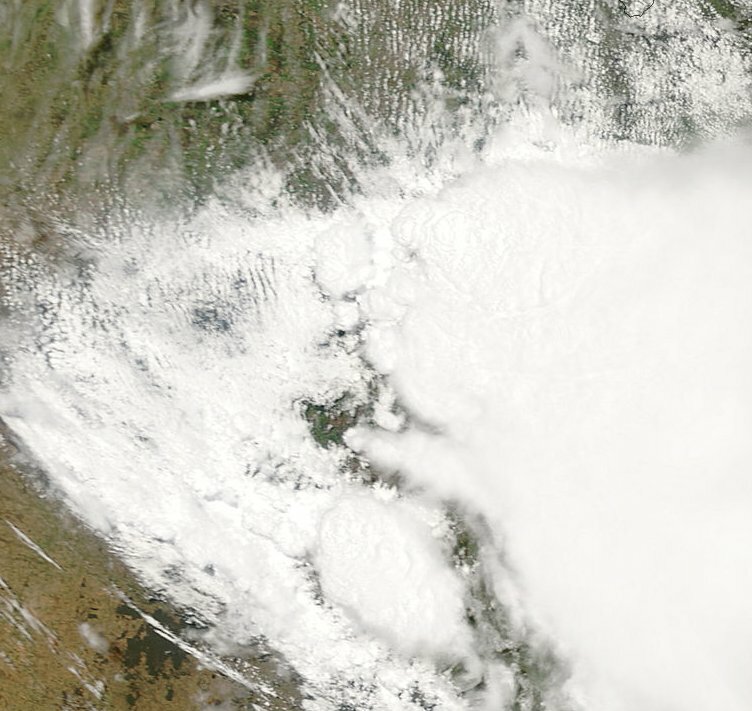 We followed the storm a little longer but it became inaccessible to our east. 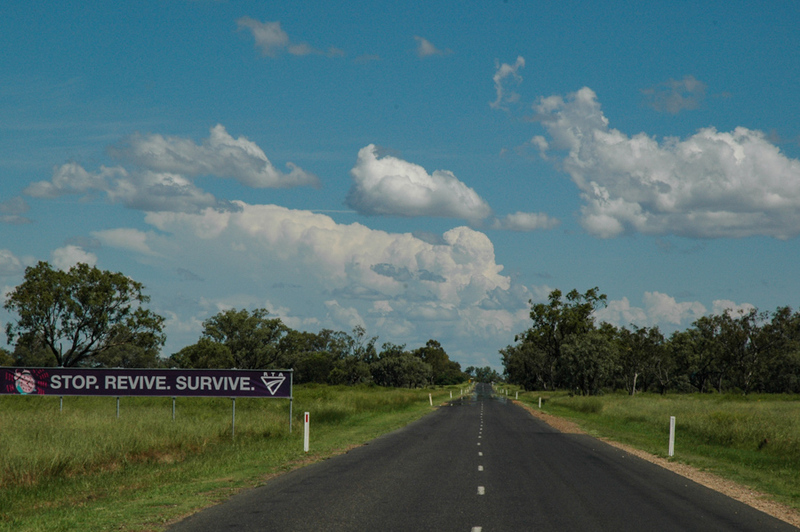 We learnt later that Jimmy had followed the storms east and ended up at Bingara. 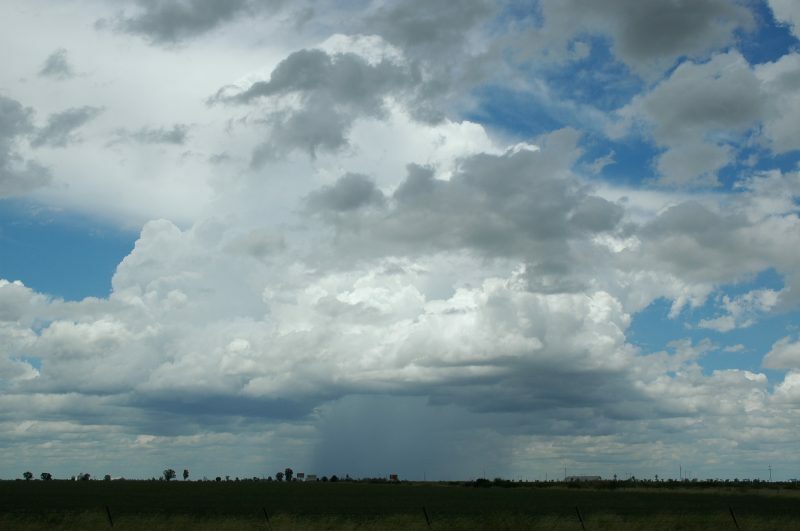 More storms in the Narrabri area lured us there to watch. 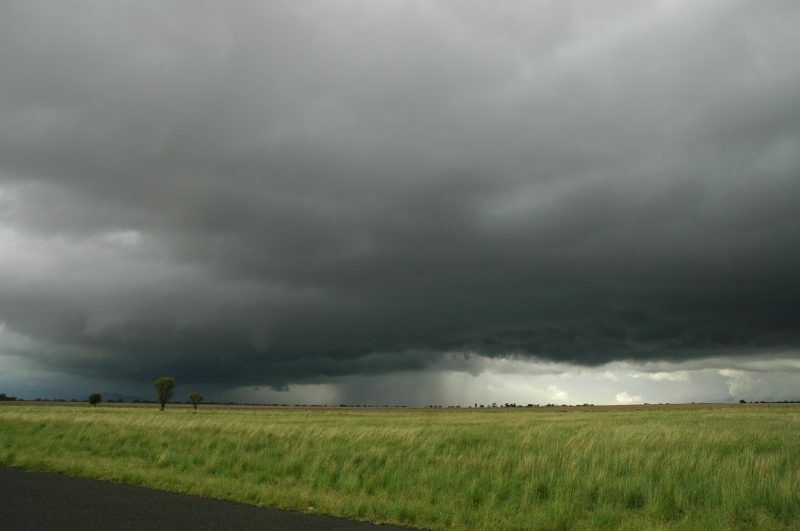 Very heavy falls of rain had occurred and had just flooded the road to Bingara. By 10am we decided to head back north to get into warmer clearer air. 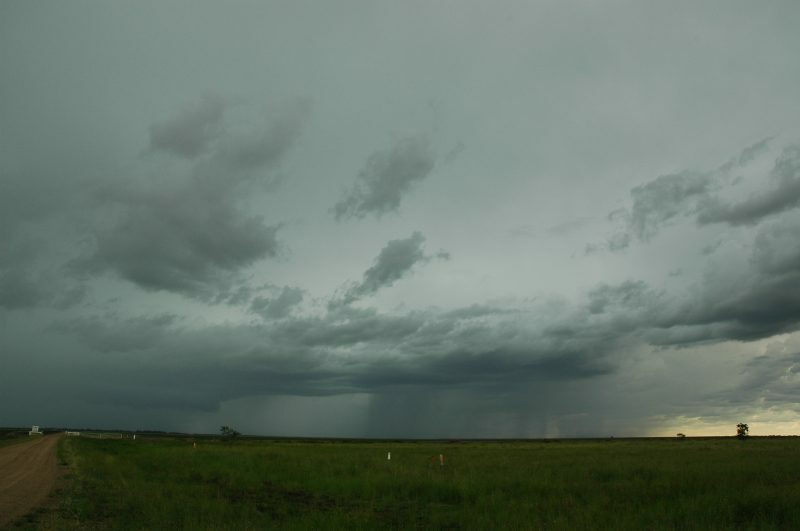 Storms continued in a WSW - ENE line just south of Narrabri, but they were no longer very lightning active and were not visually impressive. 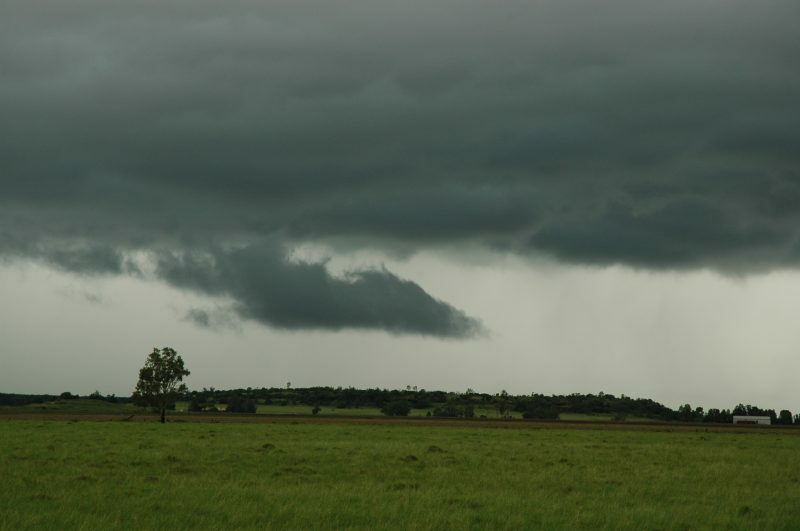 30km north of Narrabri we waited on a side road and watched the activity persist south and SW of us. 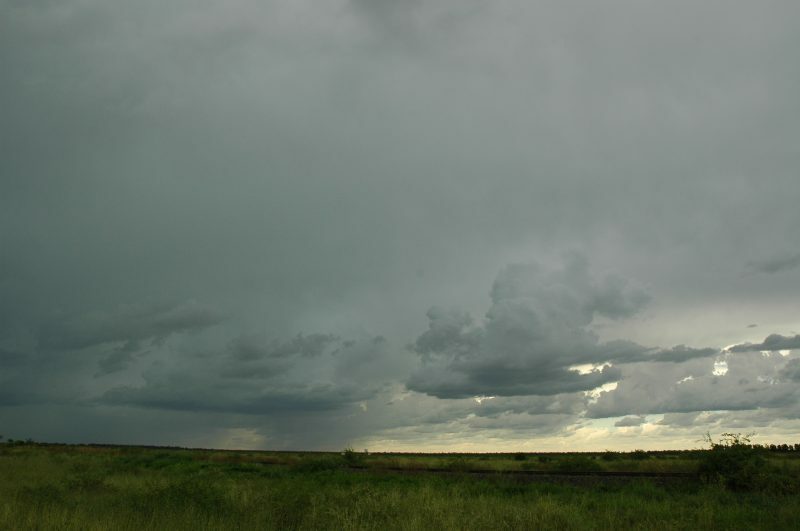 Large cumulus formed from altocumulus castellanus. There was some concern that the whole area would become cluttered and spoil chances later in the day. At 11am a stronger looking storm got going to the SE. 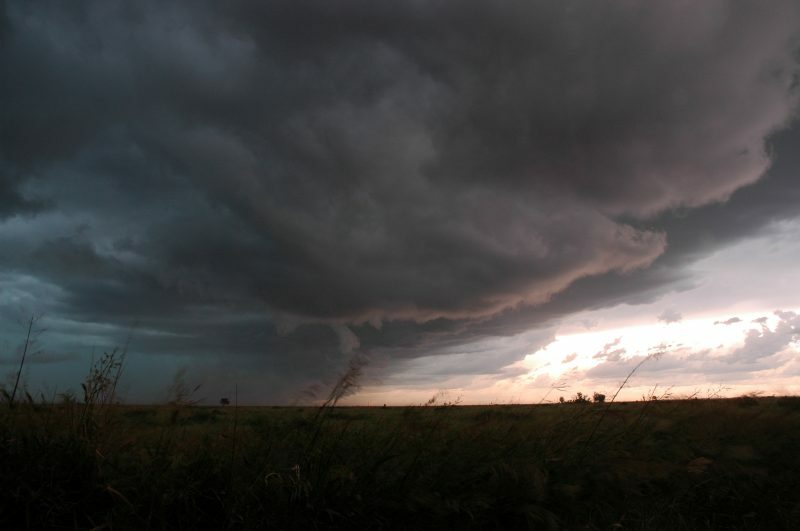 It had a gust front and other base lowerings. 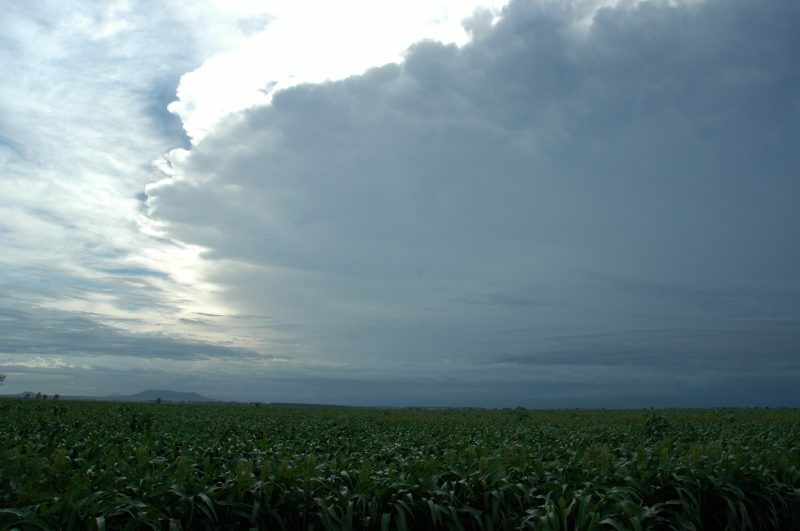 East of Bellata it had already weakened into not much. 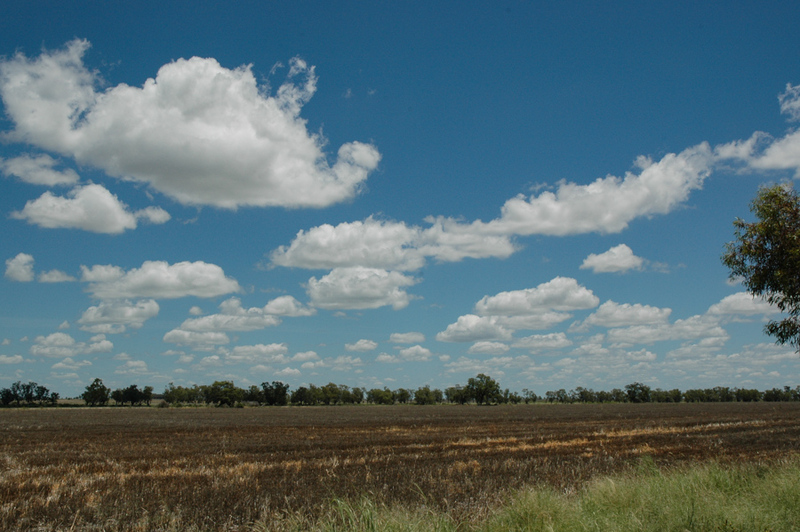 The decision was made to head back to Moree for lunch and the much clearer and warmer environment. The sky took on a different appearance shortly before 1pm. 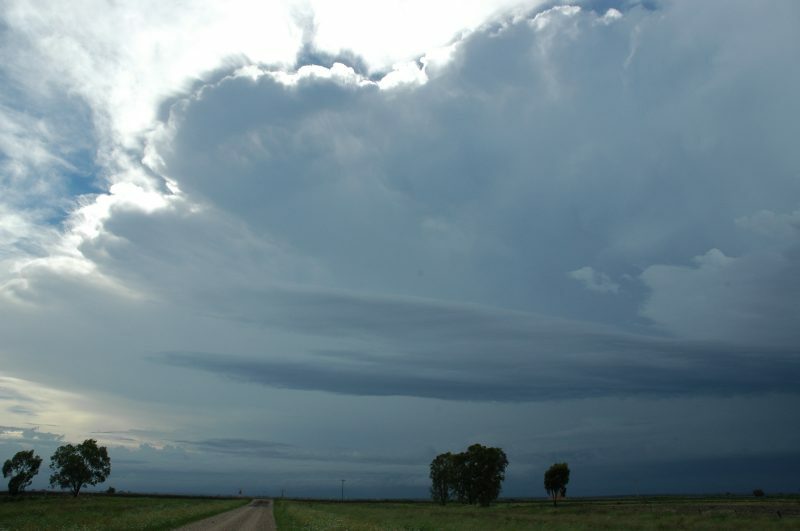 Congestus with bases at a lower level had formed, mainly to the west and SW with a storm gathering some distance to the WSW. 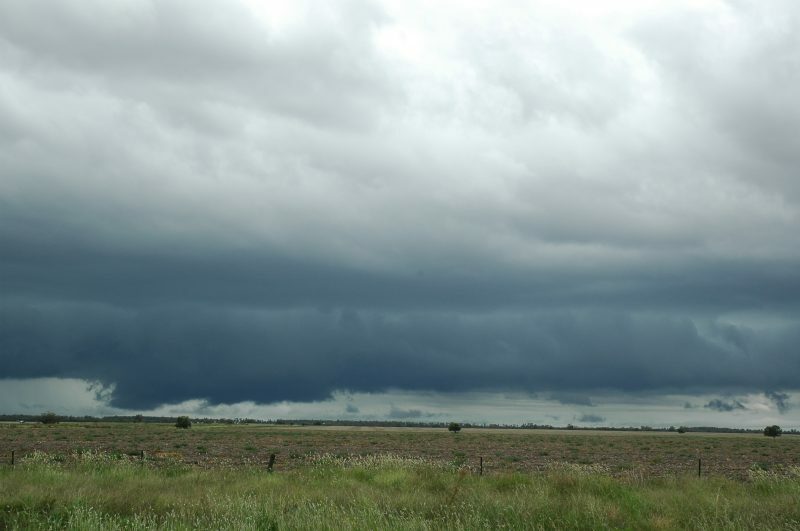 We dropped in at the Bureau of Meteorology Moree radar site to check the situation then headed to a spot 10km south of town. 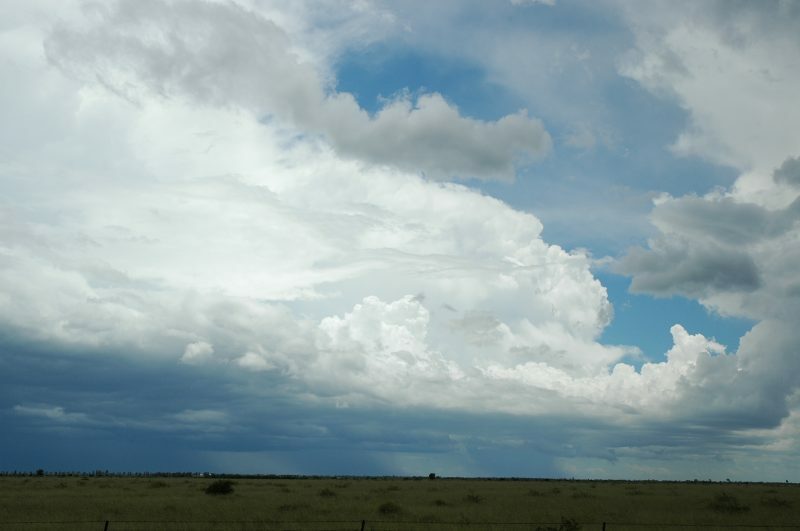 Another storm tried to develop to the N about 1.30pm but its development was slower from anvil cloud streaming overhead. 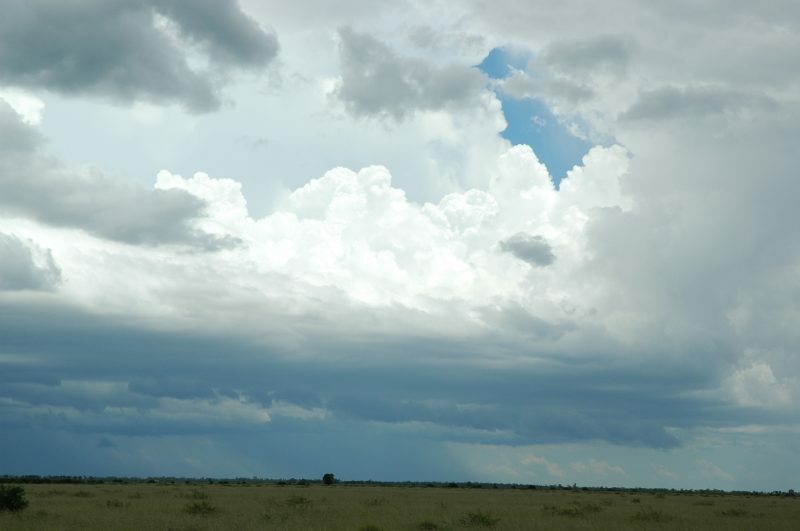 Strong storms had again formed to the south - this time about 50km away. Surface inflow winds had been gusting to about 60km/h for the past 30 minutes or so, and way above the forecasted winds. These persisted. Dave and I enjoyed the show for the next 40 minutes. 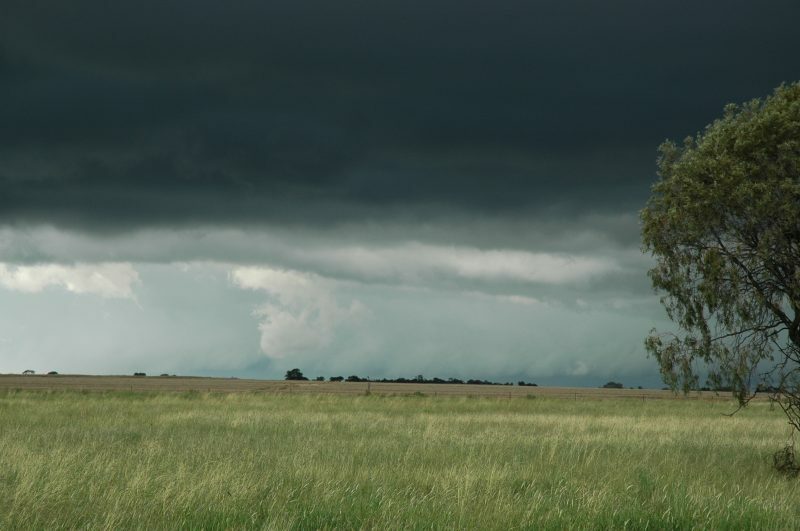 Storms were in just about all directions, some close lighting occurred with deep rumbles and booms across the countryside. 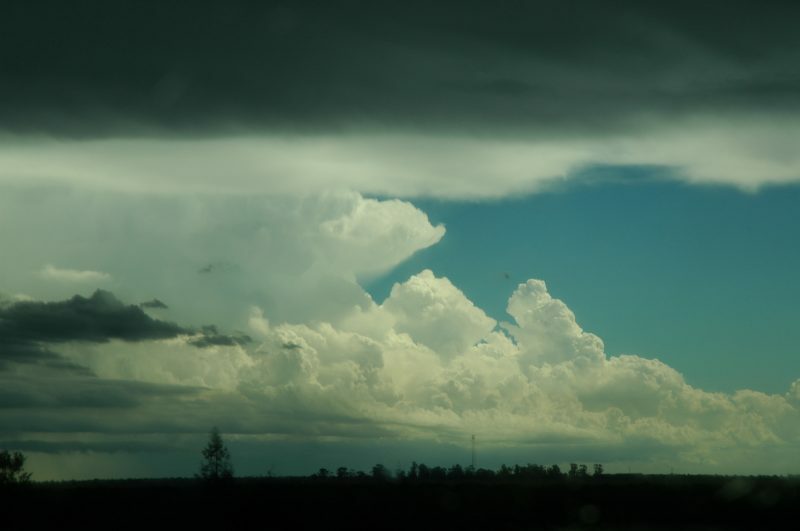 Heavy precipitation cascades formed and dissipated and some strong high contrast updrafts developed. 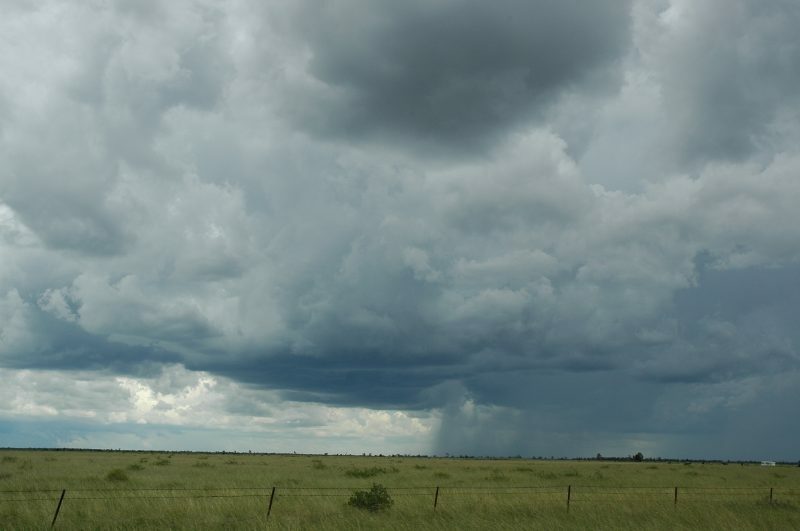 The western cell dominated and it appeared to be heading northeast. 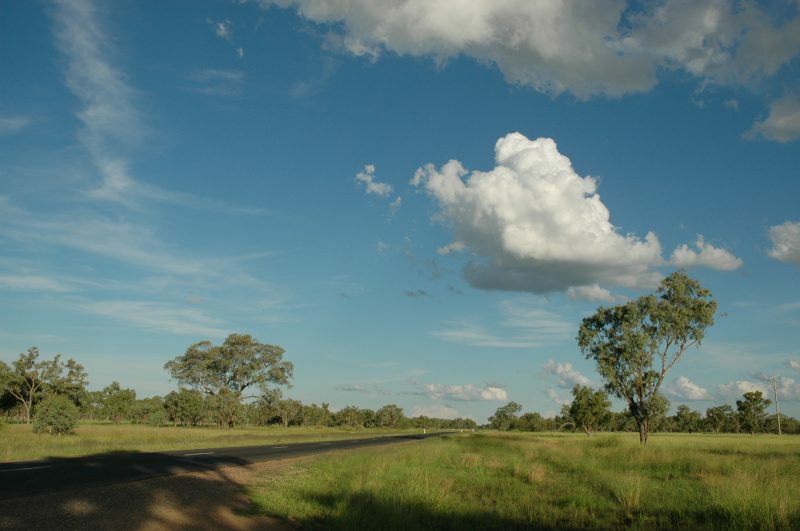 About 2.20pm we met up with Jimmy again and decided to head NNE up the Goondiwindi Road to stay just ahead of the main event. Intense lightning punched out of the bases to our NW and W and also from another storm to the SE. 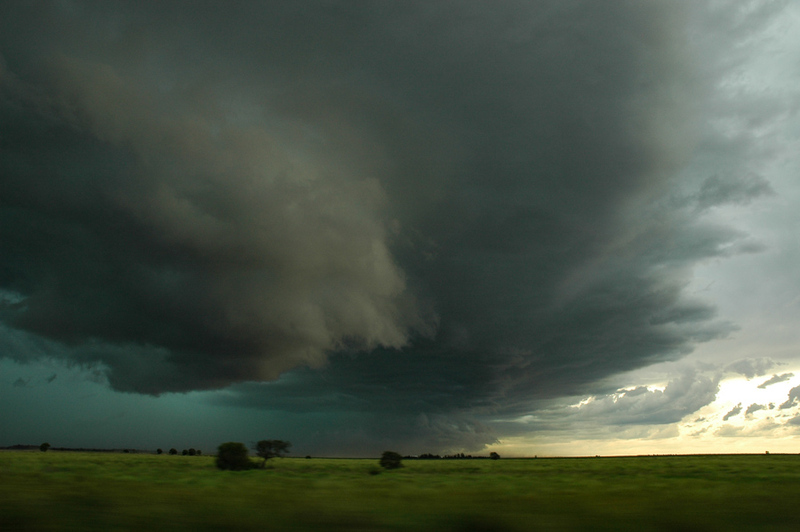 Spectacular lowerings and inflow features formed. 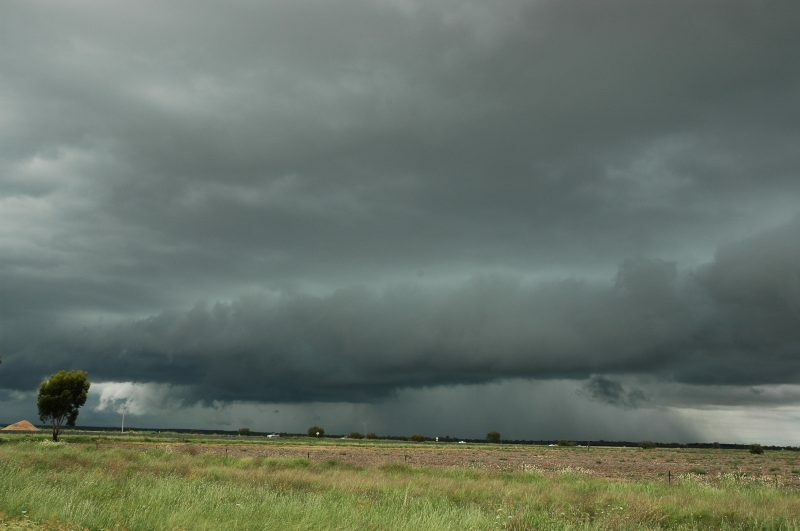 Just after 3pm the outflow hit from what had now developed into a squall line. 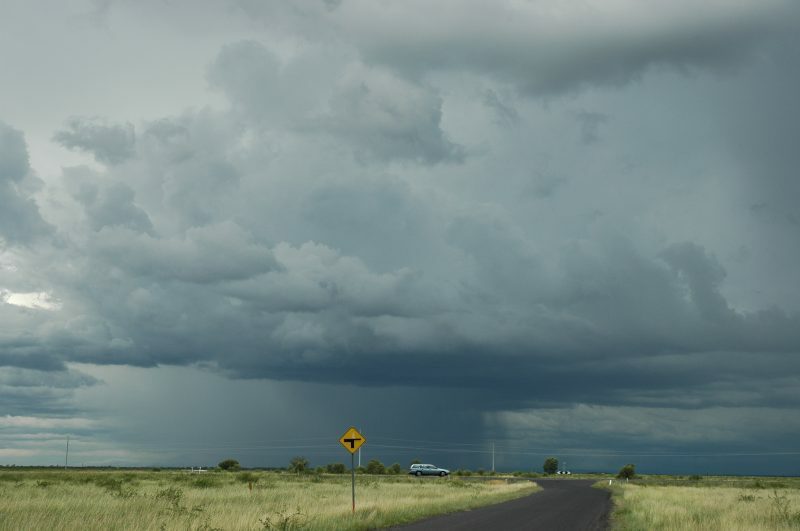 The violent winds and heavy rain hit but we soon passed ahead of this. We kept heading NNE just ahead of the storm. 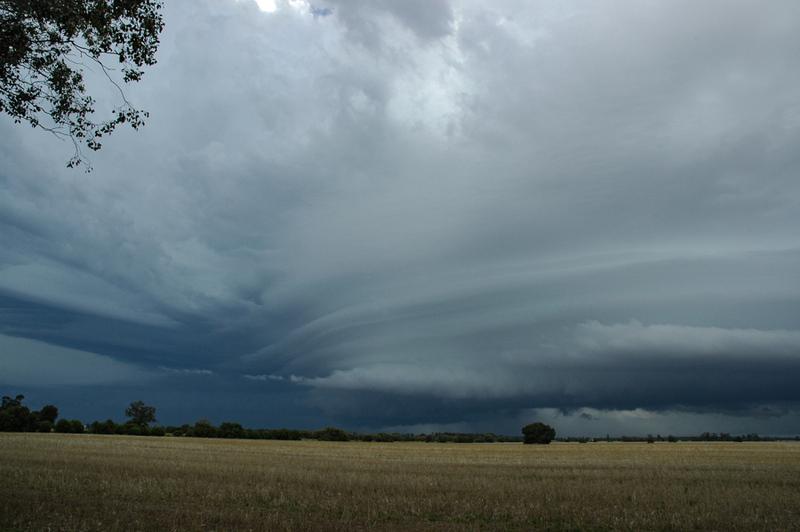 The squall line structure became quite awesome around 3.25pm. 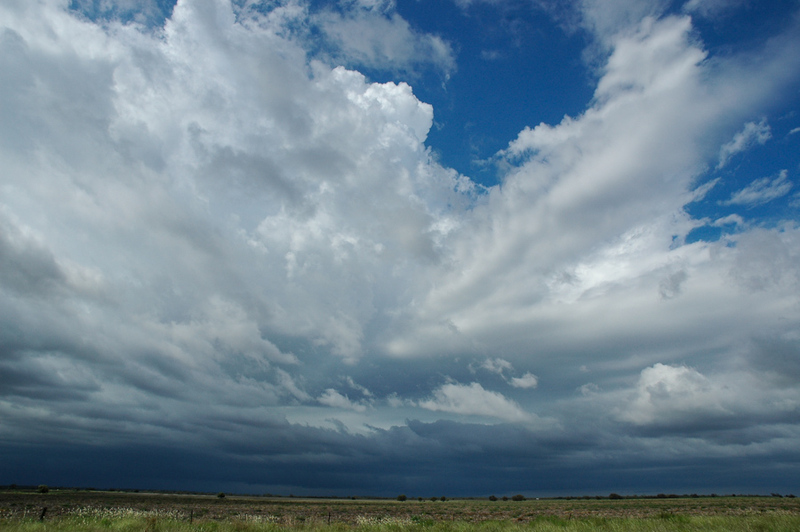 Incredible colours, frequent lightning and a banding gust front had developed about 80km NNE of Moree. 10 minutes later it was obvious the storm had caught up.... fast moving dust was just to the west, then it hit - some of the strongest winds Dave and I could remember from a storm for quite some time. Debris, dust, shrubs and tumbleweeds were shooting past us ! We could barely stand and record the event ! It was so much fun as the wind roared past and buffered us. 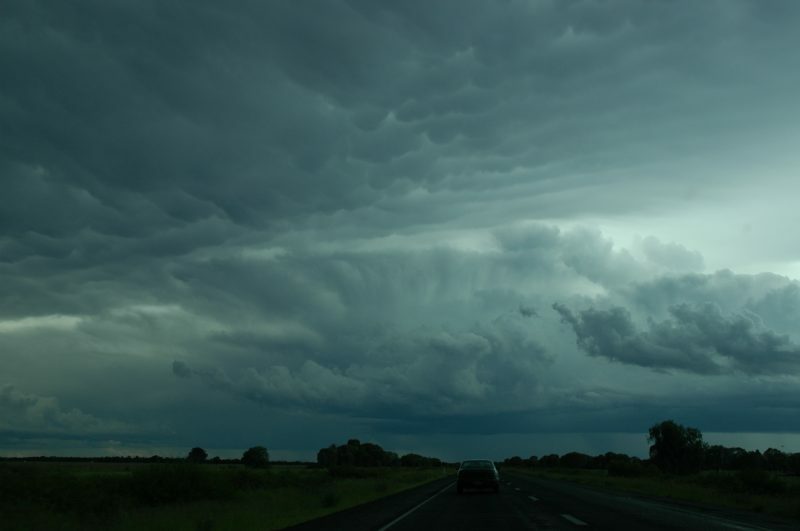 There was no expectation of large hail so we headed back the way we came, passing through intense rain and violent winds. CG lightning hit extremely close by. 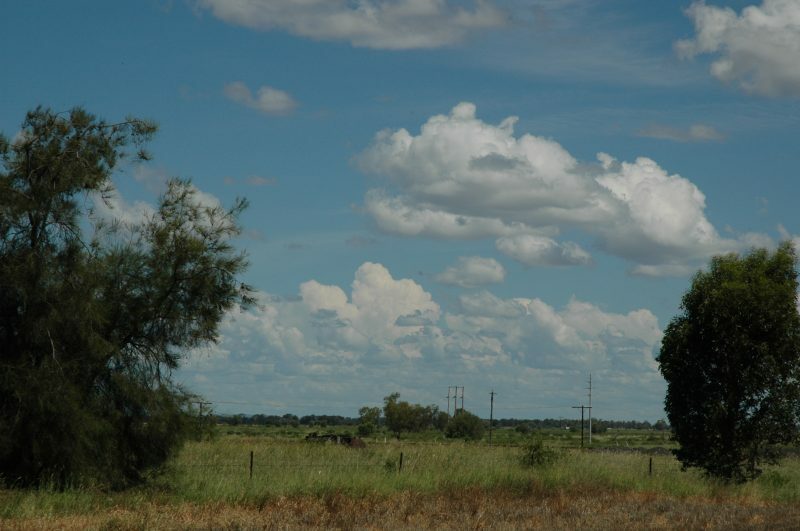 At 4pm new storm development was visible near Moree. 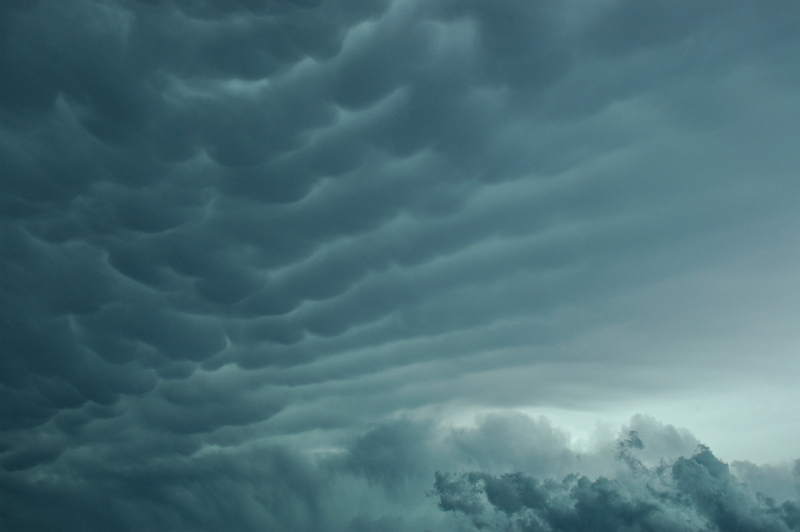 The scene was spectacular with powerful updrafts shooting up in very clear air behind and underneath a massive anvil shield with mammatus overhead. 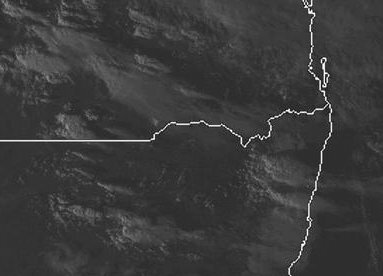 Another weaker storm to the SE contrasted this with a beautiful flanking line of cumulus. Getting closer it was apparent the new development was the last activity in a much cooler environment. Dave and I decided to start the drive home and left Jimmy to begin his journey back to Sydney. 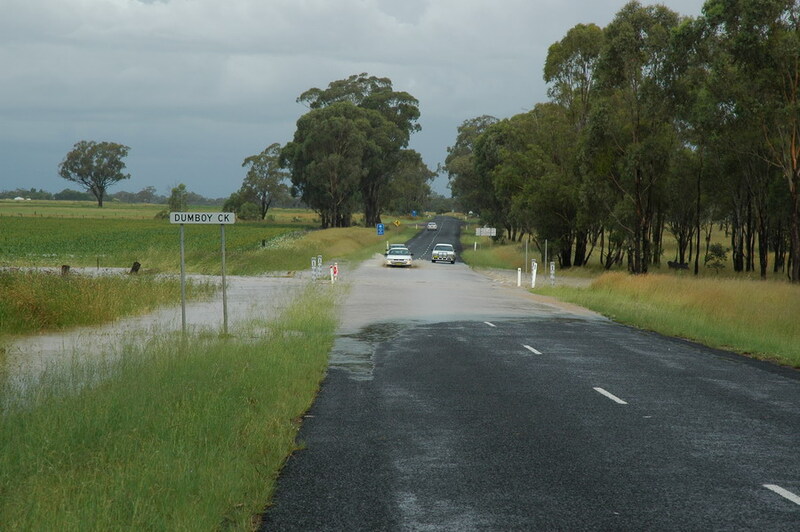 At Warialda there was evidence of flash flooding with all streams flowing very high and fast. Just west of Inverell a large creek was flowing across the road. After watching some other vehicles pass by, we drove through the fast flowing water which was about 20cm deep. 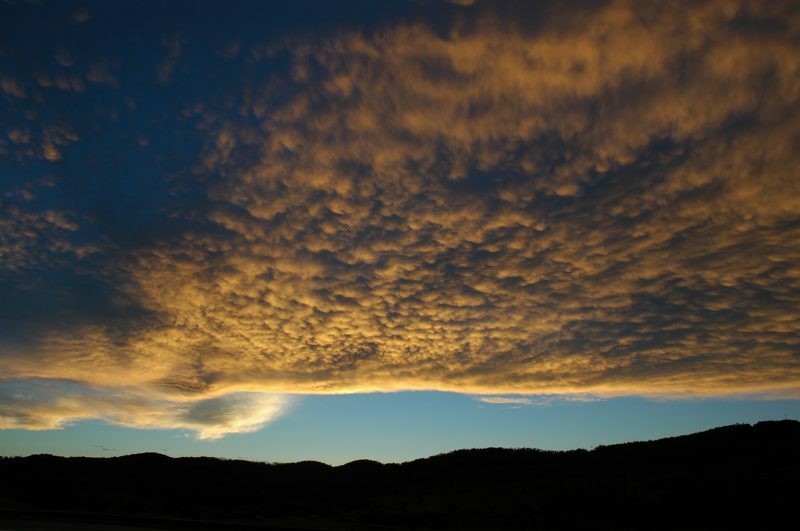 Small mammatus dominated the sky between Glen Innes and Tenterfield. 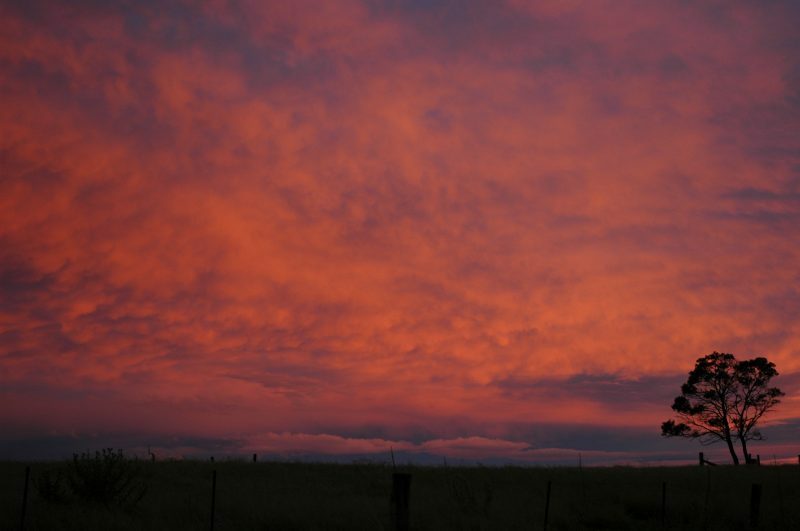 The sunset was spectacular !